Develop sustainable engineering solutions to infrastructure challenges in rural environments. 2018 Sustainability of Civil Infrastructures summer scholars. This program encourages applications from students at all undergraduate levels including freshman and sophomores. Rural areas, which contain approximately 20% of the US population (49 million people) and 80% of the land area in the United States are fundamental to human well-being in both rural and urban areas. Within the United States, rural areas provide unique resources such as the infrastructure for food and bioenergy production as well as the transportation infrastructure from inland urban centers to ports. Despite this, little attention is paid to the unique challenges and opportunities these areas face with respect to building and maintaining civil infrastructure. In this ten-week summer research program, students will work with faculty and graduate students in the Department of Civil Engineering to conduct research and contribute new knowledge to improve our understanding of how best to address the challenges facing rural environments. Through collaboration with industry partners, students will also be given opportunities to learn how infrastructure challenges are currently being addressed by the civil engineering industry. Plastics are a frequently observed component of marine debris and there is growing concern about microplastic ecotoxicity, and the impacts of sorbed hazardous organic contaminants, heavy metals and biofilms on microplastic surfaces. Rivers are considered a major source of plastic marine debris. However, the relative importance of microplastics from different terrestrial and freshwater sources as a function of land use is poorly understood and limits our ability to develop best management practices to eliminate their occurrence. In this project, we will characterize microplastics in terms of concentration, class (bead, fiber or fragment) and composition in air, soil and water across a rural to suburban land use gradient. The REU student will assist with development of the experimental design to evaluate microplastic contamination, collect samples from various environments and analyze them for the presence of microplastic contamination using a number of different methods. The main project goal is to improve the drinking water quality in rural regions that use groundwater as water source while producing valuable biomass, which can be used as a sustainable energy resource. The objective is to develop and evaluate the performance of a low-cost system using immobilized algal cells for nitrate and atrazine uptake. The REU undergraduate student will be assisting a PhD student working on this project. Tasks include: growing algae, manufacturing immobilization medium, measurements. Use of analytical instrumentation include ion chromatography, gas chromatography with mass spec, and UV-visible spectrophotometer among others. This project explores the use of virtual reality in a traffic engineering laboratory. Traffic engineering is the study of how traffic operates and the design of systems, like traffic signals, to allow traffic to move safely and efficiently. The study of traffic engineering typically uses field observations of traffic. These field observations take place along highways and at intersections. Field observations have several issues including the exposure to traffic that could be hazardous, adverse weather conditions, and the variable nature of traffic. To overcome these challenges, video of traffic and microsimulation of traffic are often used. Recently, virtual reality (VR) and 360 video are being used in educational settings. Transportation engineering has used simulated virtual environments with driving simulators for a variety of research include work on driver behavior, driver safety, and pedestrian safety and for driver training. The resources, in terms of equipment and space needed to support one person in the simulated virtual environment, are high. With the advent of Google Cardboard and YouTube support of 360 videos, along with the continuing price decline in VR systems and 360 cameras, wider use of VR for engineering education is now possible. This project has two parts (1) developing VR and 360 videos to provide alternatives for field laboratory exercises in traffic engineering courses, and (2) evaluating the effectiveness of VR to improve learning outcomes for students in comparison to traditional live field observations of traffic. The work to be done in summer 2018 consists of 360 video collection through the use of stationary 360 cameras and drones and then processing of the video into VR laboratory exercises. The GRS-IBS is an emerging technology that supports a variety of superstructures for single-span bridges (e.g., short county bridges). The concept was originally developed as part of FHWA’s “Bridge of the Future” (BOF) program to achieve faster construction of bridges and integrate substructure with the superstructure (i.e., eliminate the “bump”). The GRS-IBS has many advantages over conventional pile-supported bridge abutment systems, such as lower cost, faster construction, and better performance under extreme events (e.g., earthquakes). Of the nearly 500,000 bridges in the national inventory, the majority (~80%) is single-span bridges (less than 100 ft in length). Many of them were built within the last 30-40 years and in need of replacements, particularly in rural areas. GRS-IBS can be effectively applied to replace such a basic “bread and butter” bridges at reduced time and cost. Nonetheless, lack of confidence and experience with the GRS-IBS in Nebraska is hindering an active adaptation of the new and innovative construction technology. In this regard, there is an urgent need of research to advance the implementation of GRS-IBS more systematically in Nebraska. 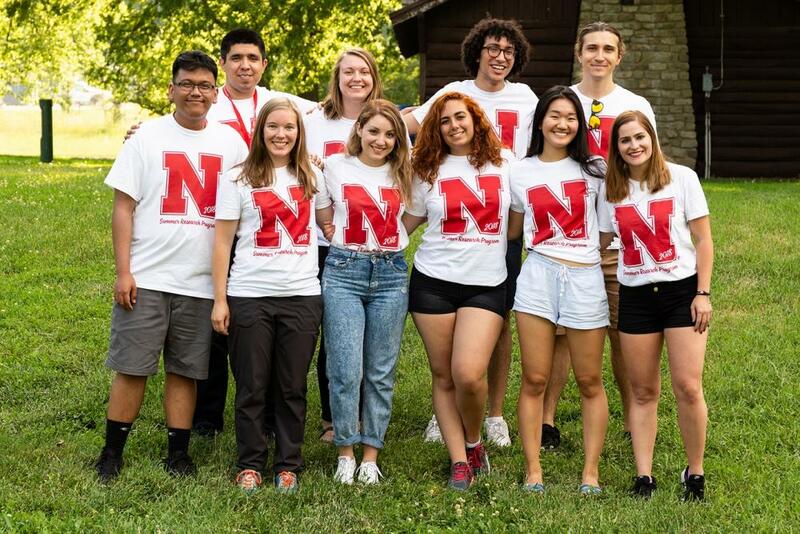 In this project, the REU student will be primarily involved in collecting data for single-span bridges in Nebraska, conducting geotechnical lab tests as well as numerical simulations to investigate the behavior of GRS-IBS system with the Nebraska soil conditions. This project will enhance fundamental understanding of the material properties and fracture characteristics of individual phases in heterogeneous mixtures that are often used in transportation infrastructure such as roadways, rails, and airfields. In particular, we are interested in optimizing key design variables of the overall infrastructure performance in rural conditions that are quite different from key factors considered for urban infrastructure systems. This research effort will be based on our previous research and will incorporating several advanced features, including moisture- and temperature-dependent material characteristics, nonlinear-inelastic cracking at different length scales, multiscale test methods, and multiscale computational models. Project outcomes are expected to dramatically improve our ability to assess the effects of individual mixture components and their interactions on the overall infrastructure performance, so that safer and more economical design of mixtures and infrastructures can be achieved. The proposed approach is transformative because it is expected to increase the ability to predict damage-dependent behavior and the service life of an entire rural infrastructure systems while minimizing testing effort and producing more accurate predictions than current phenomenological approaches that are mostly based on previous observations, experimental data, and/or forensic analyses. In this project, the REU participants will be primarily involved in performing multiscale experiments necessary to characterize material properties and fracture characteristics of the mixture components (or phases) and interfaces between components. The extensive use of antimicrobials (AMs) in the livestock industry for animal disease treatment/prevention and growth promotion has promoted the emergence of antimicrobial resistant bacteria. Antimicrobial resistance genes (AMR genes) - the genetic materials that render resistance mechanisms to bacteria - can proliferate among the bacteria in the environment. If human pathogens acquire AMR genes and become antimicrobial resistant, antibiotic treatment will lose its effectiveness in treating infected individuals (Walsh 2000). The goal of this research project is to understand the fate and transport of AMs and AMR genes in the agricultural environment and develop best management practices (BMPs) to control their proliferation. In the proposed project, the REU student will work with faculty and graduate students to test pilot-scale reactors for their effectiveness in removing AMs and AMR genes. Samples will be collected from the reactors periodically, and will be analyzed for AMs using advanced analytical equipment and for AMR genes using molecular techniques. Through this project, the student will learn how to use advanced techniques to measure AMs and AMR genes in environmental samples. The student will also discover how different management practices may influence the fate and transport of AMs and AMR genes in the environment. With greater demands on global agricultural productivity and groundwater resources expected in the coming years, the need to better understand the links between agriculture and water environment has never been greater. This project investigates the direct and indirect impacts of climate change on the transport of nutrients and pesticides in soil and groundwater. The REU participants will be involved in collecting data to evaluate the environmental impacts on water and soil quality from agricultural and industrial activities under a changing climate. This project represents a transformative shift in the methodology used to manage bridge infrastructure and rationally extend service life by transitioning toward a performance-based paradigm. Extending infrastructure service life is of particularly significance for sustainability of rural infrastructure, where construction activities become increasingly costly with increasing distance from larger population centers and associated manufacturing capabilities. Structural reliability addresses the relationship between two fundamental components: the load applied to a structure, and the capacity of the structure to support loads. Both of these aspects have been characterized probabilistically for general use and codified for application in the practice of structural engineering. Rural bridges are evaluated in the same manner as typical highway bridges, despite the fact that the loading characteristics for “off-system” rural bridges are markedly different from typical highway loads, with much lower traffic rates, yet periodically high loads from farm equipment and agricultural freight. To address the objectives of this project, data will be compiled from various sources, including surveys, selected weigh-in-motion records, and data mining of social and economic drivers to provide a targeted representation of the loads applied to individual rural bridge structures along transportation routes and corridors. The specific research tasks for the REU student could include data collection and processing (mining) from disparate sources; collaboration with faculty characterize loads and correlate available data to representative loading representations; assisting with deployment, data collection, and post-processing of sensor output from bridge tests; developing models to correlate sensor data to physical performance; and performing sensitivity studies to investigate optimum reliability and proposed metrics for asset management and decision-making. This project will leverage advances in computer science and machine learning to capitalize on past health monitoring successes (e.g. bridges, buildings, pavements, intelligent transportation systems) to effectively interpret and manipulate Big Data, extending service lives while ensuring safety for rural bridges. Successful deployment of smart infrastructure system(s) will drastically change the way transportation infrastructure is managed and how resources are allocated. In this research project, we will investigate which sensors and sensing systems are appropriate for smart infrastructure, what component and system models need to be implemented, and how component and system degradation can be adequately addressed. The research project will incorporate neural network modeling to examine potential benefits of various smart infrastructure system configurations, coupled with validation and calibration using advanced computational modeling and laboratory and field testing. The implementation of neural network models will provide smarter and faster bridge health assessment capabilities, improving upon existing prognosis tools using real-time integration of various data sets ranging from physical models and load testing data to traffic demands. Physical models will be used to predict system responses, including implementation of advanced, time-dependent constitutive relationships. In this project, the REU participant will assist in construction and calibration of neural network models and will work with graduate students to refine models using laboratory and field data. This project specifically addresses rural sustainability by providing a mechanism to reliably understand and quantify rural bridge condition in real time, thereby making those structures last longer and require less raw materials for repair and replacement. Quantifying performance of raw materials used in the construction rural bridge networks via the deployment and evaluation of the proposed “smart infrastructure” system helps establish how those materials can be more effectively managed and integrated into designs. The outcomes of this project will fundamentally change the way bridges, one of the most vital components in our transportation network, have been designed, implemented, assessed and managed. REU participants will be integrated into all aspects of the work, from understanding how structures and systems are modeled and updated to predict response under varying loads over varying timeframes and reflect changes in bridge “health”, to being actively involved with laboratory and field investigations of the response of single bridges and groups of bridges to simulated and actual demands. Rural communities are home to millions of people and small businesses, and are found in a wide range of geographic locations across the United States. As such, these rural areas are routinely subjected to extreme loads and natural hazards including earthquakes, tornadoes, and hurricanes. Compared to their urban counterparts, rural communities suffer greater losses in the wake of these events and take a considerable number of years to recover, if at all. This is due, in part, to a lack of knowledge regarding the response of rural infrastructure to extreme loads and how this response contributes to the resilience of rural communities. This project aims to understand the vulnerabilities of rural infrastructure, including agricultural systems, to various dynamic loads and to develop relationships between the failure of these components and the overall resilience of the community. In the context of this project, the REU participant will assist a graduate student in the development of numerical models of rural infrastructure components and analyze the response to extreme loads including those generated from earthquakes.